Here we go again, Does any one remember the White Owl Cabins? I think they located at the end of Paugus Bay or somewhere close to there. They were on the opposite side of the road but had lake access. There was always something going on, especially on the weekends. Magic shows, dances,etc.The cabins were so small I remember that a double bed took almost the whole cabin up. There were probably ten, maybe twenty cabins? I caught my first fish there and my grandmother promptly cleaned it and cooked it for me. I hated it! I think they were white in color and seemed to be spread out over quite a bit of property. I guess I am showing my age but my first summers were at the white owl cabins. I remember the White Owl cabits, they were directly across the street from the Margate. They had a swimming pool and as you said very tiny cabins. They were right about where the shopping center is. I remember there was a farm stand on the corner and I think a Kentucky Fried Chicken was in the same area. I spent many summers there and then we moved to a cabin on the lake side at the Margate, then we moved to Silver Sands in Gilford. I spend all summers there from 1960 thru 1975, we would come up right after school got out in June and spend all summer there until labor day weekend when we would go home. We would do our school clothes shopping at the Mamouth Mart that was across from the airport road. The White Owl Cabins were built by Albert Cobb on land he purchased from Thomas McIntyre in 1933. He and his wife operated the business through the mid 1940’s. I believe he passed away and his wife then sold to Robert Rae in 1946. Ralph and Helene Poudrier purchased the business in 1963 and operated it for a number of years (into the 70’s or possibly even the 80’s). I seem to remember there was a dining room attached, as well. I always thought they were a neat group of cabins, as they were nestled in a lovely pine grove, allowing privacy and seclusion from the busy traffic nearby. It was sad to see those pines cut down when Shaw's moved in. I stayed there in the early 90's after attending a company summer evening party on The Mount. The owners were very friendly but wanted to make sure I was not going to have a party or "guests" after the cruise. Right...I just wanted an inexpensive place to stay before heading home in the AM. They were very well kept but very small. The Margate now occupies what was previously the White Owl's Lakeside Cabins and Beach, noted as items "B" and "I" in the aerial. The main property was situated where Shaw's is today. Here are a couple of historical articles about the White Owl. The first dates the White Owl from 1929, as a 1933 article (75 years before the article date of 2008) states that the White Owl cabin colony was in its fourth year of operations. The article also refers to McIntyre's pasture. Later this intersection became known as McIntyre Circle, as it is still known today, even though today there is no traffic circle, just a traffic light at this intersection. This second article from 1937 shows that owners had a kind of a problem that was quickly solved by the police! Does anyone else have some old postcards of the White Owl that they would like to share? Fascinating stuff Boardwalk Bluesboy! These places were like going to camp for adults and families with the communal dining room and evening entertainment. (No computer, TV or gameboy etc.) I'm trying to imagine driving up to the lake without a super-highway....imagine Rt. 28 all the way from the Boston area? Last edited by mcdude; 02-16-2009 at 08:03 AM. The White Owl post cards are terrific. I was wondering if anyone had photos and glad you came through and posted them. I never realized all the various attractions that small piece of property held. Much of it was hidden away by the thick evergreens. Warren Huse’s article sheds more light on its early beginnings and it seems it was older than I thought it was. Very interesting indeed. Pertaining to the Gilman farm (McIntyre pasture), I believe one of the first houses in that part of town was built by Thomas Sewall. It is mentioned in many of the old deeds to describe properties “on the road leading from Lake Village to Thomas Sewall’s”. Thomas was born in 1784 (died 1868) and his wife was Dorothy Bartlett (1785-1862). Their daughter married Hiram Gilman and the place became known as the Gilman farm after they took up residence following the deaths of her parents. I recall back in the 1940’s there was a house just north of the Howard Johnson Restaurant on Lake Shore Road and believe it must have been the Sewall/Gilman house. The property was subsequently purchased by Thomas McIntyre. The land extended across Lakeshore Road to where Lowe’s is today and consisted of a web of stonewalls dividing the various pastures. By the mid 1940’s much of it had begun to grow back into a wooded lot, although a section was still being used to pasture a cow or two. There was a blueberry field there with the sweetest berries in the world. I did a little more digging at the Registry of Deeds today and found two lease agreements recorded between McIntyre and Cobb. The first was dated 11/1/1929 and was a five-year lease of the land “for the purpose of erecting a home, dining room and over-night cabins. Cobb was to pay $250 per year. If within the five-year lease period, Cobb wished to purchase the land, he could do so for $3,000. The second lease agreement was dated 6/12/1931 and was also a five-year lease. The cabins had been erected on the property by that time. The yearly amount began at $450.00 in 1931 and would gradually rise to $600 by 1935. If Cobb wanted to purchase the land within the five-year period, he could do so for $20,000. Cobb did indeed purchase the land from McIntyre on 8/31/1933. McIntyre purchased the Gilman farm property from Harry Terrill in 1925. It had been conveyed to Charles Terrill in 1911 by Alice J. Gilman (Hiram Gilman’s daughter) and thereafter referred to as the Terrill farm in subsequent deeds. does anyone know when this closed, my family and I went to the Margate in 92 and I don't remember it being there then. What's there now at White Owl? My parents owned the White Owl for a short time, maybe 1960 or 61 to 1963, then we bought a motel in Florida and moved away. But I remember the place well. By the time we owned it I think the lakeside set of cabins had been sold off to another owner, so we ran the main block of 50 cabins and 8 or 10 motel rooms, and the recreation hall. A swimming pool had been added as well, but I don't think the restaurant was open when we bought the complex. While we were the owners the barn burned down one afternoon, but there were no horses anymore - the barn was simply used for storage and laundry. The cabins were all constructed of native pine and were small but quaint and fun. I'm curious to know if anything still exists of the White Owl, or if the land has been developed in some other way. I can't figure out what the original address was, I was trying to look on Google maps to see if it was still there. Find More Posts by Karen N.
Actually Karen, if you have Google Earth just zoom down at the corner of Rt11 and Weirs Blvd. It's shown as Lake st and Union ave also on GE. Right across the street from the cemetery. Interesting to hear that the White Owl had nearly 60 rental units. All in all, it was quite the operation. Here are some more postcards that I'd been saving for a while. Now seems a good time to post them. Here are the lakefront cabins, marked #41-#46, that were later replaced by the Margate resort. The motel directly adjacent to the Margate on the Paugus Bay waterfront used to be called the Monaco Beach Motel. The building is still there. I recall hearing somewhere that the Margate bought the property several years ago and uses it for employee housing. If I'm not mistaken,forum member AC2717 owns one of those units. The White Owl Cabins - "For a Happy Vacation"
Got to love the guy playing Croquet with what looks like a tie on. Jeez your on vacation chill dude!! That's not a tie....It's chest hair. The White Owl Dining Room. 1948 postmark. The White Owl Gift Shop. And Ice Cream too! Interesting thread. Thank you all. I always wondered why the Jct of Rt's 3 & 11 was called McIntyre Circle. So, now I know where the McIntyre name came from, but no idea why it was called a "Circle" when it was really a fork, at least in the 50's-60's. 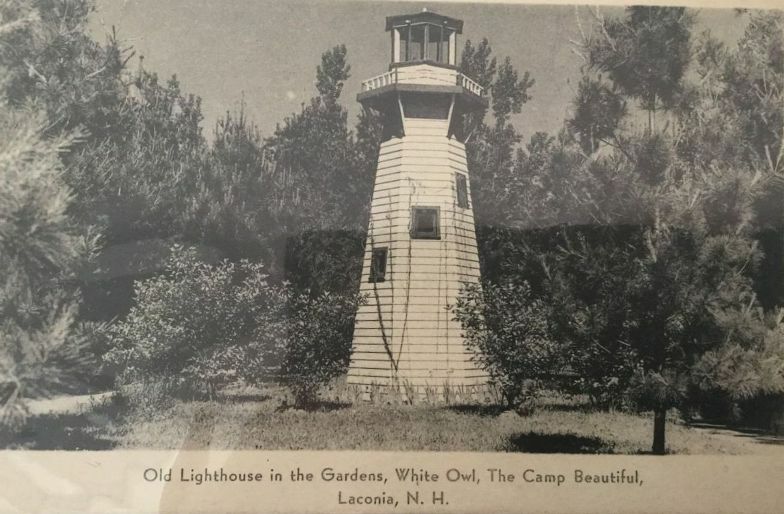 I believe the town/city line is Lakeshore Rd, so the main White Owl complex was in Gilford, and the lakeside cabins were in Laconia, right? Thank you all for this interesting thread, a great history lesson about the area. Posted this image elsewhere but it really belongs here as well. I'll never forget the time that one of the dishwashers asked her to come across with a raise and she replied "I'll come across with a hickory stick"
Things have changed haven't they? Haha...so true.Don't think I'd dare threaten one of my washers with a stick.